The key to the success of the Development Mine is that it is developed specifically for your company and provides practical suggestions and ideas that can be incorporated into ongoing development plans. It's like having your own company development guidebook that everyone can access. It makes development easy and practical - because it really shouldn't be that hard! 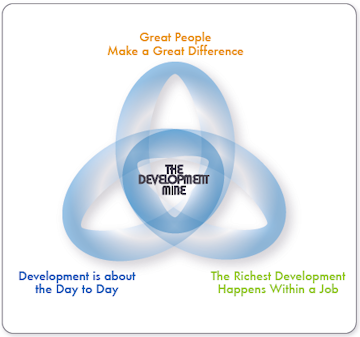 Development Mines are built specifically for an organisation. We take your existing competency framework and develop ideas and suggestions for practical on the job development. With easy on-line access, employees can look through the Development Mine for ideas that are relevant to them and then create for themselves a Development Directory. The directory then forms the basis of development plans and supports positive development discussions with their managers. In addition, there are guidelines for both managers and employees on how to have a productive and positive development discussion, a simple competency specific survey to help people identify their areas of strength and the ability to tailor ideas to the uniqueness of any organisation.